The oeuvre of Scottish artist Scott Myles is strongly gestural. It consists of photographs, objects, serigraphs, paintings, and performance-based projects, a kind of reactivation of ideas on the valuation of art and social reality by means of the reuse of already established aesthetic codes. Thus, along with known art-historical works and their themes, concepts such as generosity or communication play a big role and, with this, the involvement of the subject in his/her own environment. Myles’ works, however, also always deal with his experience as an artist, with the role of the viewer, and a certain openly avowed romanticism vis-à-vis the values and the works he reactivates. Along with this is a high degree of fictionalization and, included in these fictions, the potential for producing art. 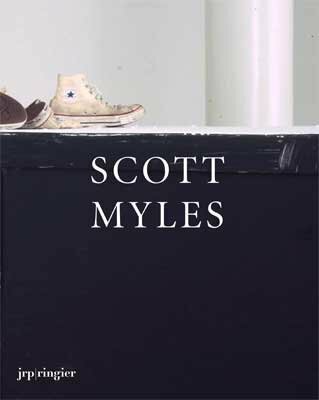 The present publication is the long awaited epilogue to Scott Myles’ first institutional solo show in 2005 at the Kunsthalle Zürich. It allows us a comprehensive look into his artistic production from 1999 to 2006, and attempts to explore his work thematically via an in-depth discussion between Rob Tufnell and the artist, as well as through an essay by Caoimhín Mac Giolla Leíth. hardcover. Publisher: JRP Ringier, Zürich, 2007.